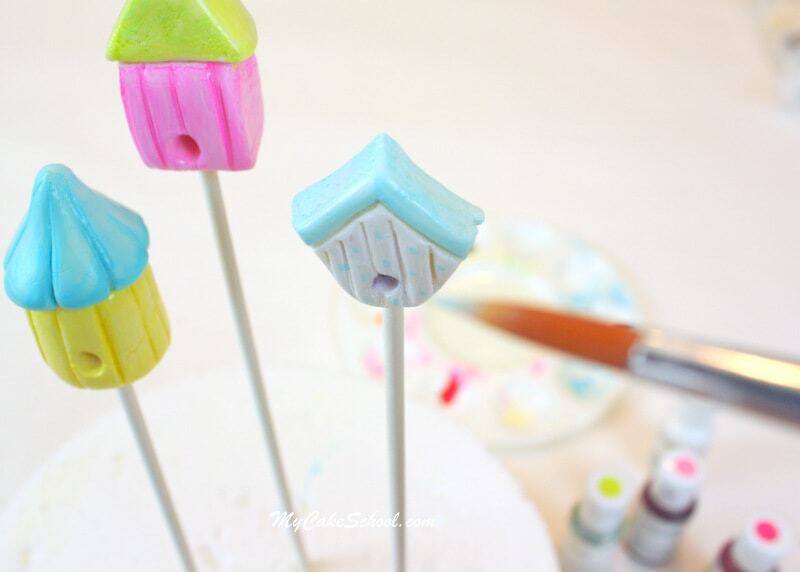 In today’s tutorial, I’m going to show you how to make the most adorable fondant birdhouse cake toppers! 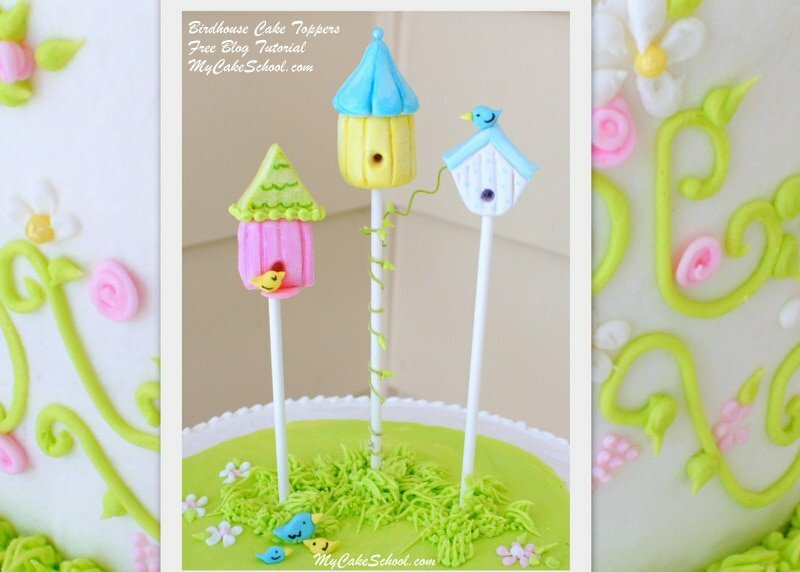 These are the perfect accent for your springtime cakes (or if you are like me and love anything bird-related, they are perfect all year round)! 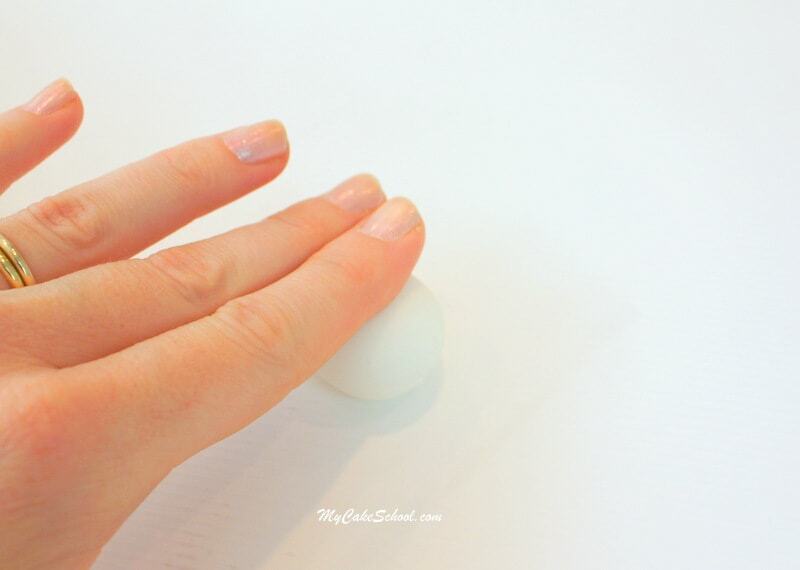 I started with a round ball of fondant approximately 1 inch wide. 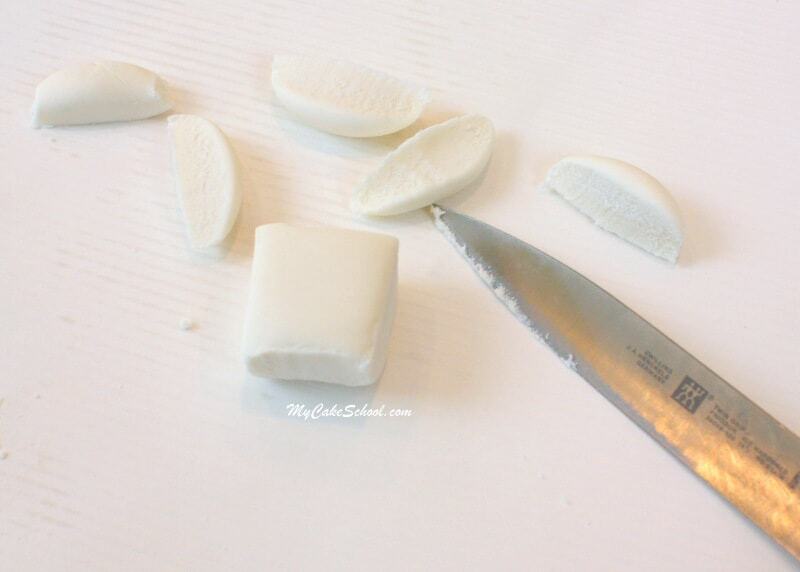 If your fondant seems very soft, knead in a little tylose (or you can use gum paste). I kept the birdhouses nice & small so that they wouldn’t be overly top-heavy. 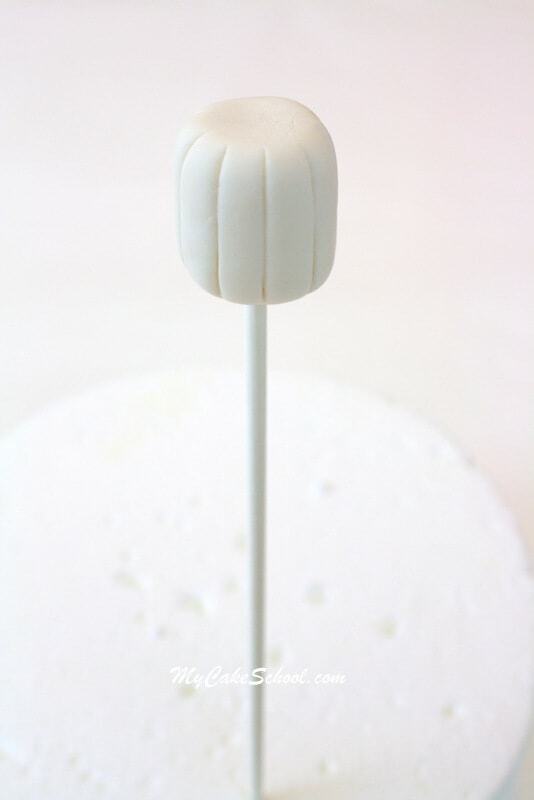 I rolled the fondant into a ball until nice and smooth, and then rolled it into more of a cylinder. …and then added creases with my knife for an added detail. 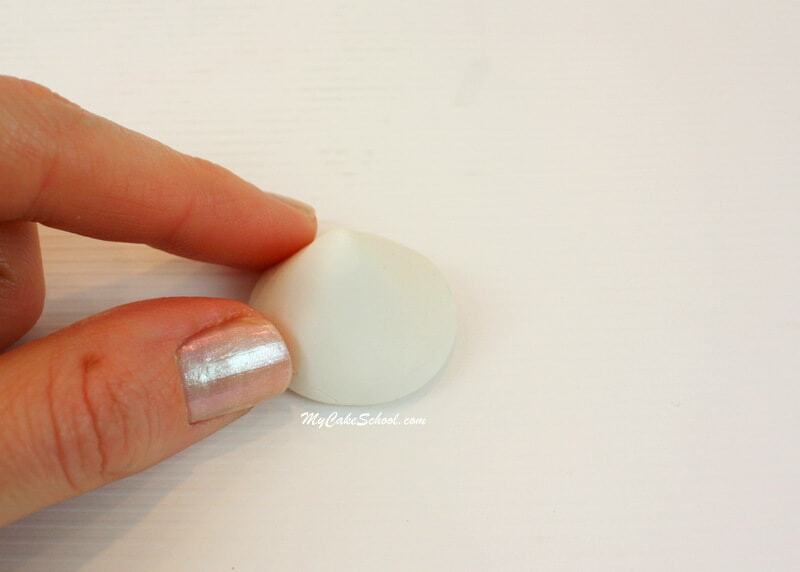 To form our roof, I used a piece of fondant about half the size of the “body” of the birdhouse & rolled into a ball (approx .5 inches in width.) — Then, I flattened the bottom and shaped into a wide cone, approximately the width of the cylinder that we made in the previous step. I used a toothpick to add lines to our roof, and then added additional pressure at the base of each line to give the edge of the roof a scalloped look. I added the roof and used a bit of piping gel as my glue. Then, I created a hole with my paintbrush handle. The first birdhouse can dry a bit while you work on your next birdhouses. I usually just poke my stick & birdhouse into a block of syrofoam. 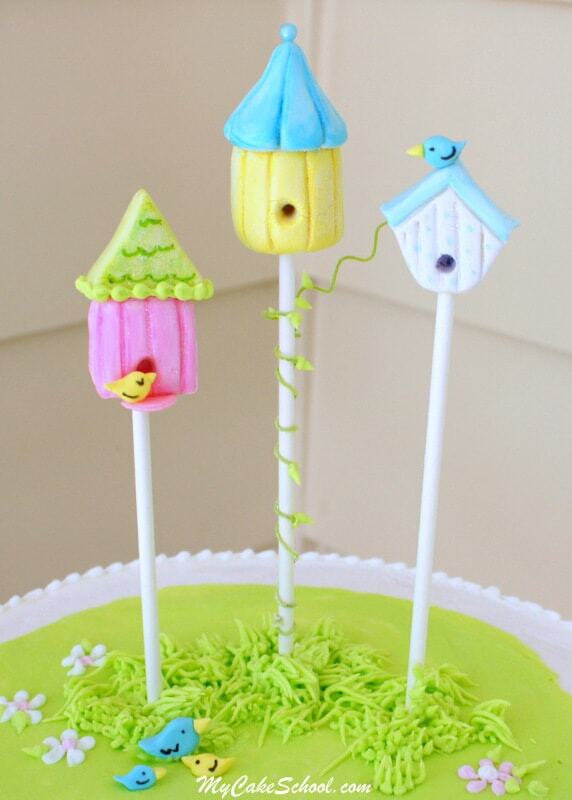 If your fondant birdhouse is very soft, and you are afraid that it will slide down the stick, just lay it on a bed of shredded paper towels, pillow filler or your “fluff” of choice. 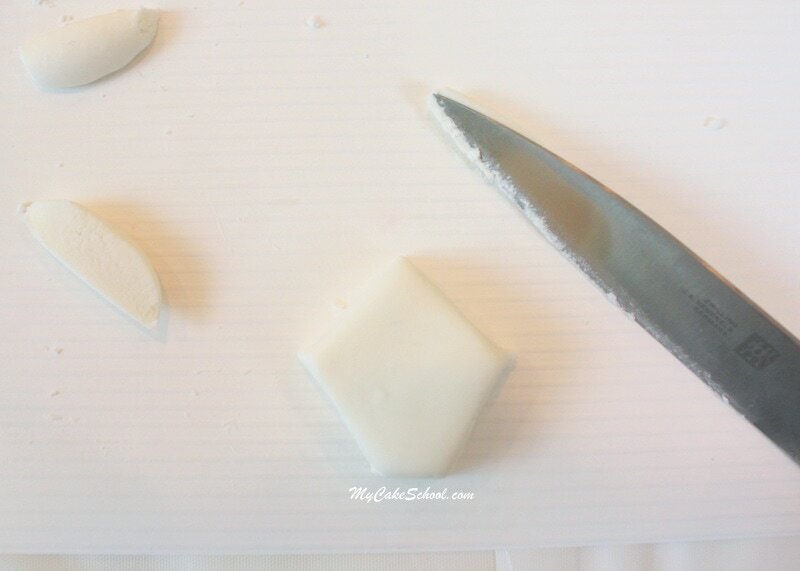 The basic idea is the same, but this time I trimmed my flattened ball of fondant into a square. 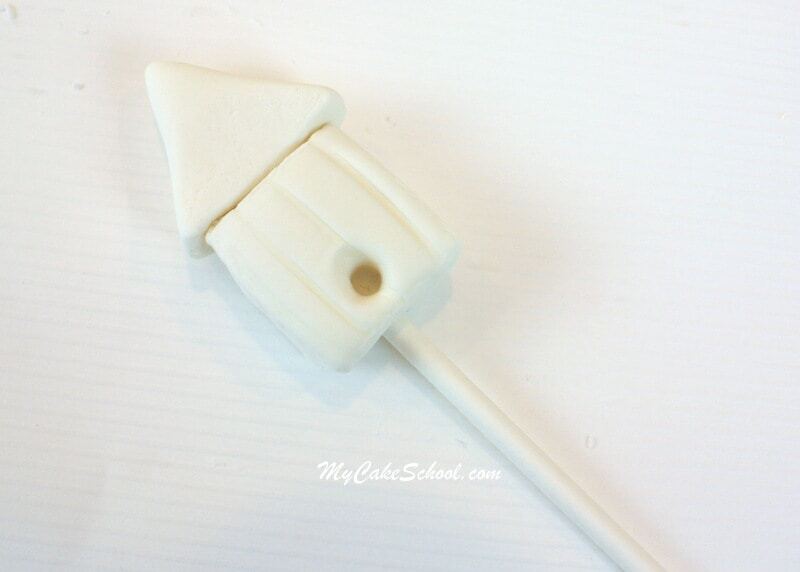 I added details with a toothpick, a triangle of fondant for a roof, created the hole & inserted the stick just as before. My next birdhouse is a pentagon shape..
Painting is my favorite part! Design however you’d like. 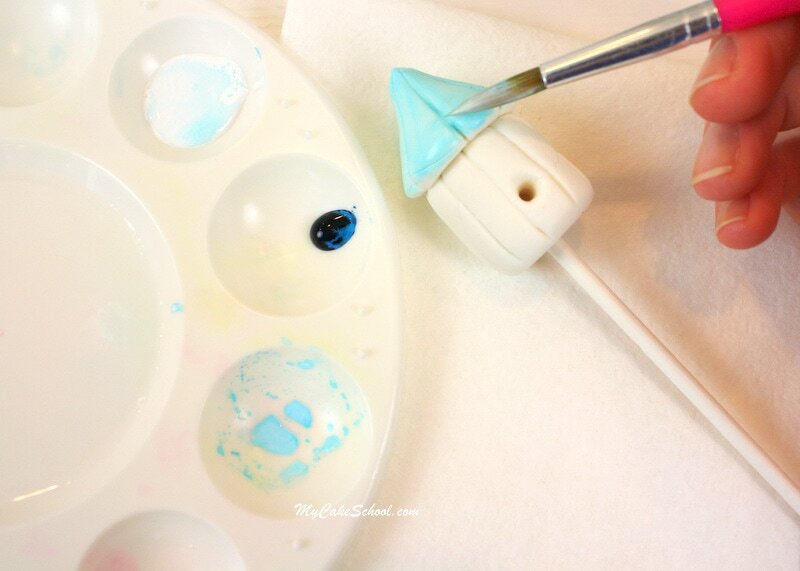 I used the following colors: Americolor Electric Green, Deep Pink, Lemon Yellow, Sky Blue, & Bright White. I added a little detail to the edge of our green roof using a bead border of buttercream piped from a Wilton 2 tip. 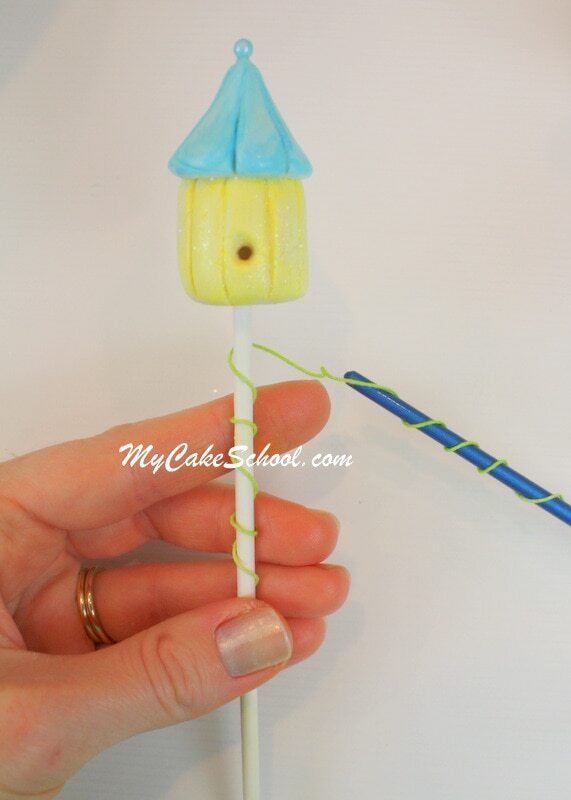 Next, I wrapped a 32 gauge piece of white floral wire (painted with our “paint” of green coloring gel & vodka), around the lollipop stick of our yellow birdhouse. I spiraled the extra with a paintbrush handle. 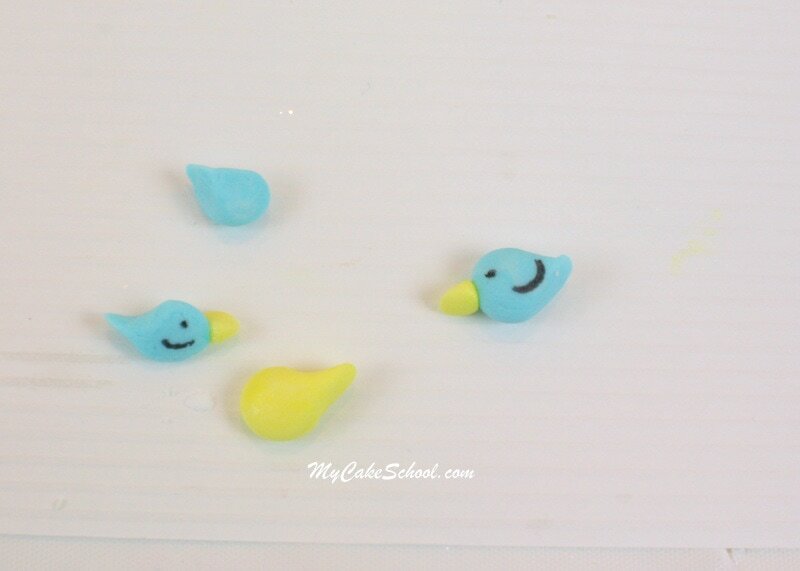 Next, I made our birds! 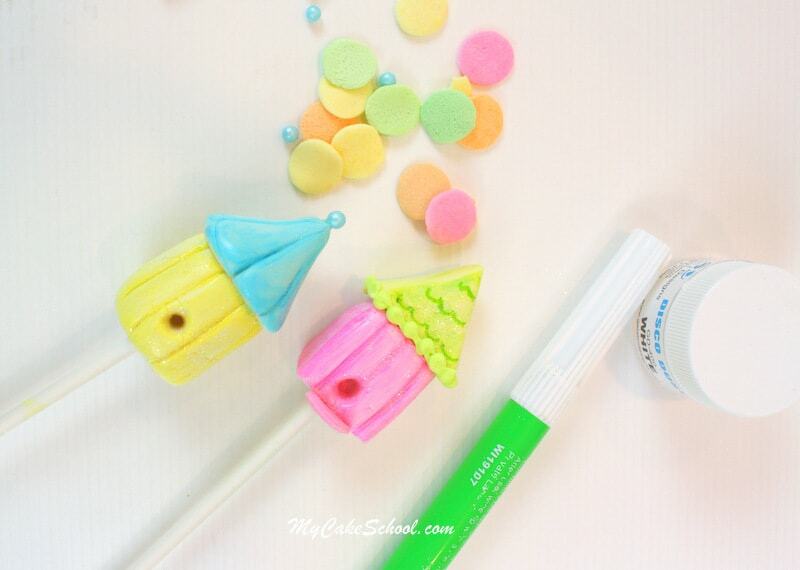 Teardrop shapes of fondant with fondant beaks & food coloring pen accents. Now for the cake decorating! My cake is an 8″ (3 layer) cake, frosted with a crusting vanilla buttercream. (Two favorite crusting vanilla buttercream frosting recipes from our Recipes section are: Fluffy Vanilla Buttercream & Classic Vanilla Buttercream.) My frosting is tinted with Americolor Electric Green & Deep Pink. 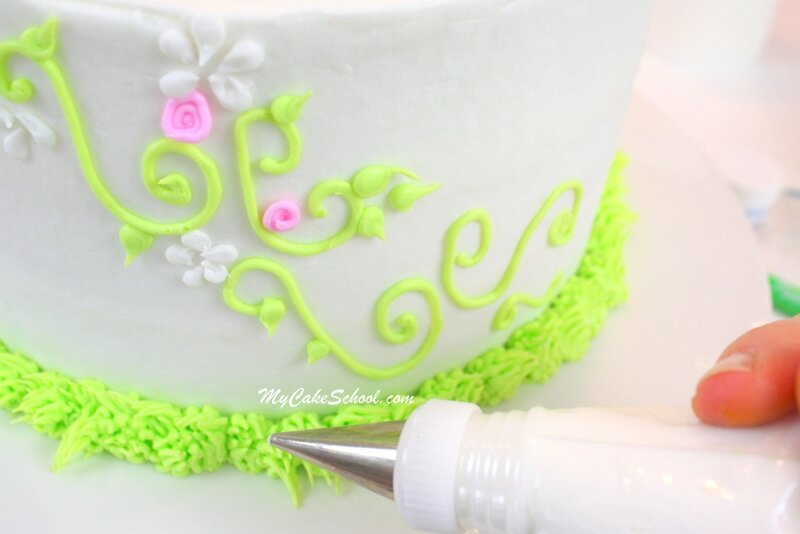 Using a piping bag fitted with a small round tip (Wilton 2), I piped scrollwork around the sides. If you are not comfortable with scrollwork or would like another design, polka dots or a scattering of piped daisies would work nicely too! …then, I added leaves (still with our Wilton tip 2). I also added a border using my grass tip (#233). 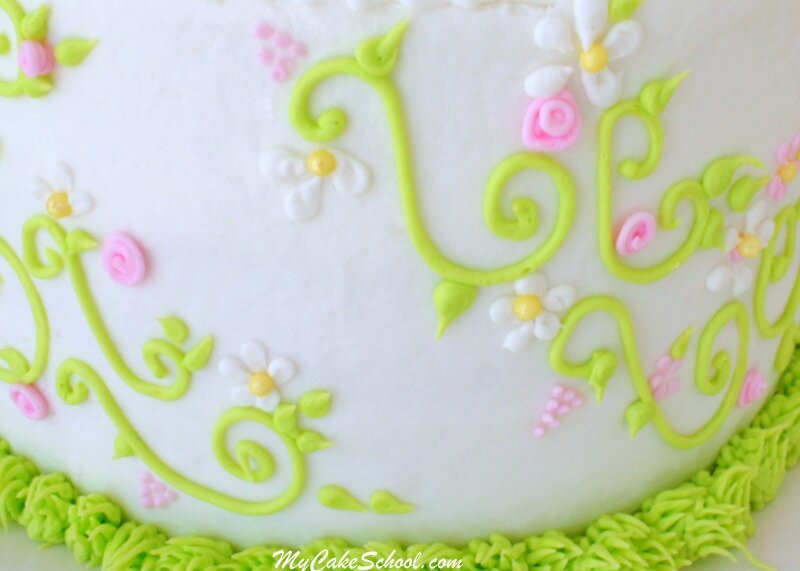 Here is a closeup of our finished scrollwork/floral design. You can see that the flowers are very simple, but the look is elegant! I pushed our birdhouses into the top of the cake, added a few birds here and there (& attached a couple to the birdhouses with piping gel.) Cuteness!! 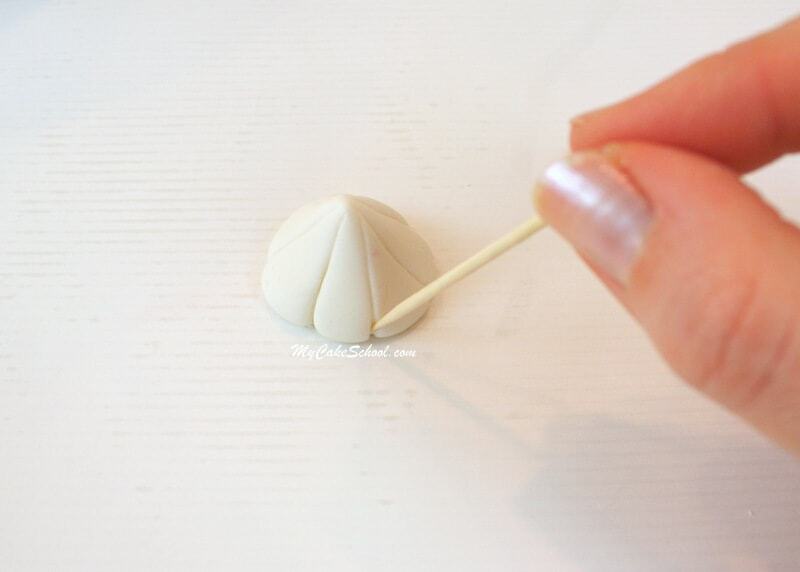 I also added a small bead border around the top of our cake using a Wilton tip 2. Now, our cake is finished! I hope that you enjoyed this tutorial! The birdhouses are so simple & cute, & no matter if you have one or several, they instantly add a dose of charm & personality! 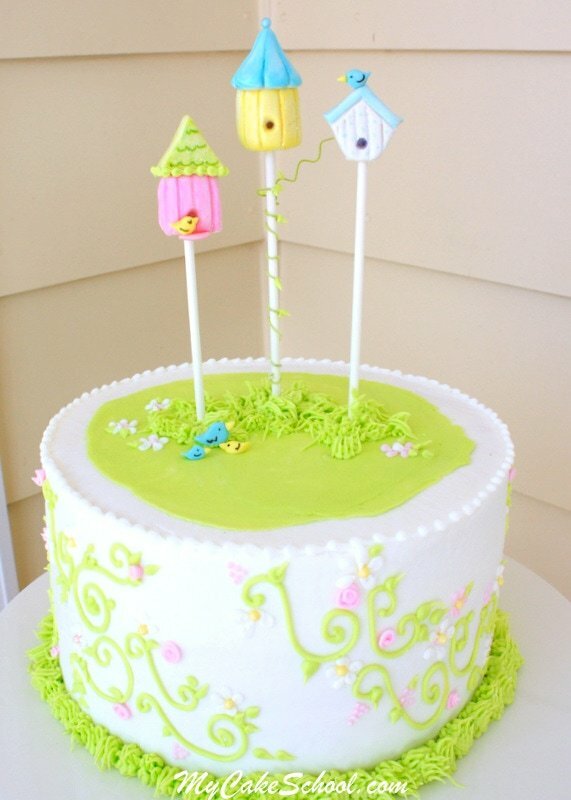 *I think that it is best to add the birdhouses just before your event, especially if transporting the cake. Since the toppers are top heavy, it just makes things simpler! Love the step by step video’s….thank you it helps so much!! You are so incredibly talented. Your ideas are fresh and new and I don’t think I have ever seen a design I didn’t like. I think you might have the best “job” in the whole world! Thanks for sharing your awesomeness!! 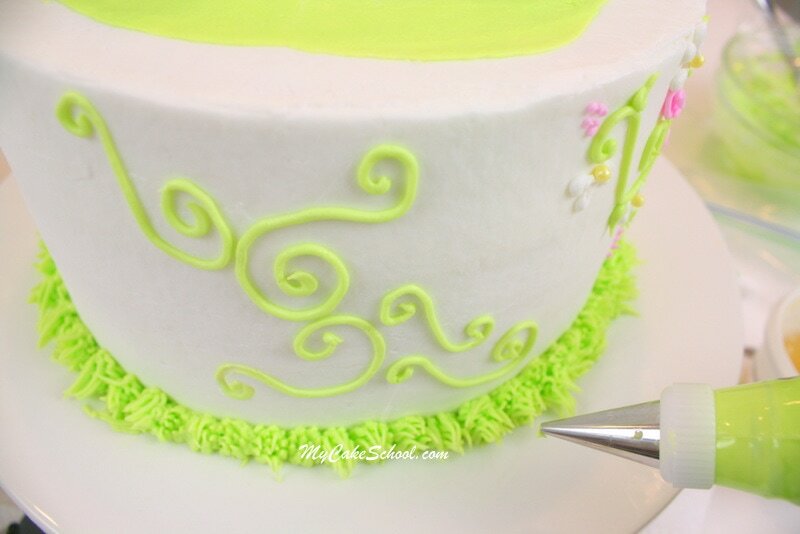 The flat round green section on the top of the cake is made from what? Is it fondant or buttercream? Thank you so much. 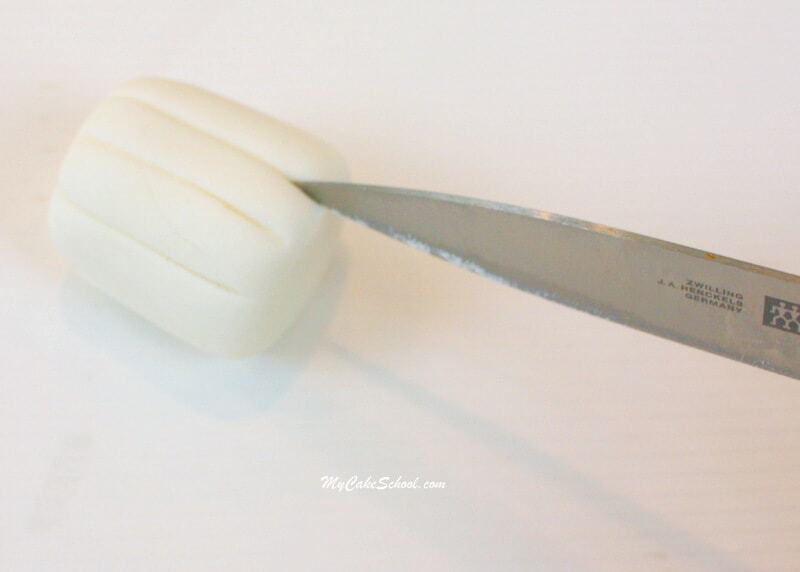 @Marlene– Yes, that is buttercream also. 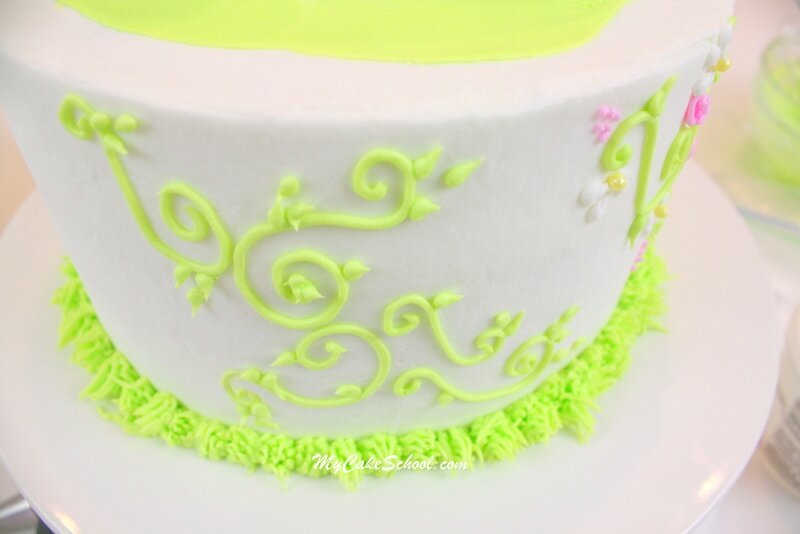 Once the white layer of buttercream was smoothed, I decided to spread on an additional layer of green buttercream on top to represent grass (and then smoothed that also) . Is it too soft? If so, add a bit more confectioners’ sugar to thicken it up. Also, if you have very warm hands it can soften up the frosting. 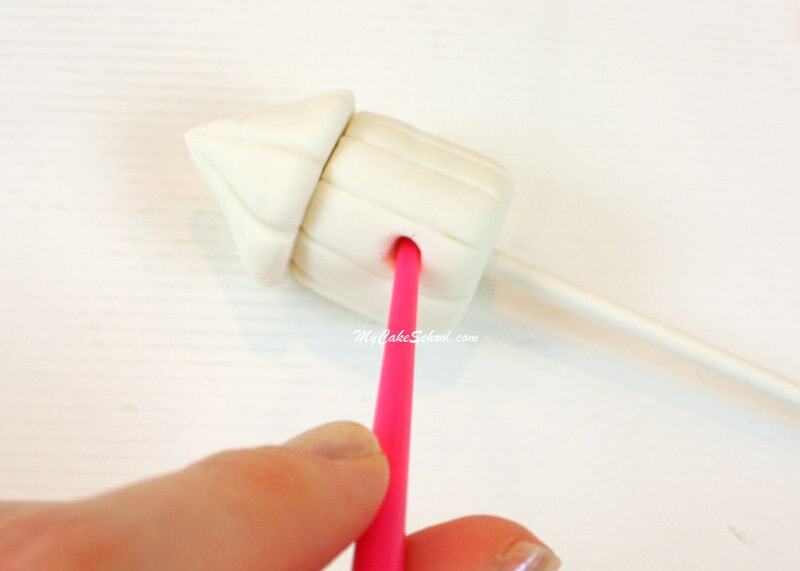 You can put your piping bag into the refrigerator for 5 minutes or so and let it firm up again. I love this cake. These small bird houses are really very beautiful. If I make it, I will not eat it but will keep it with me as a decorative element. I will definately try to make it in home.